He was diagnosed in 2011 with ALS, commonly known as Lou Gehrig’s disease. Last month, U.S. President Barack Obama signed into law the Steve Gleason Act to ensure that Medicare and Medicaid cover devices and accessories that aid people with disabilities. 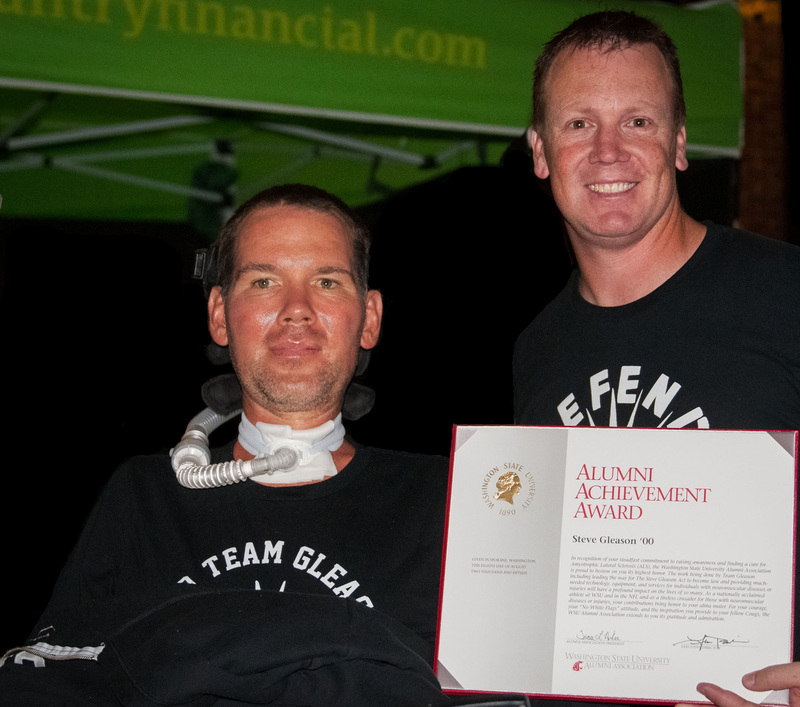 Steve Gleason, left, and Grady Emmerson, a former WSU football teammate and friend, at Gleason Fest on Aug. 8. Gleason was born in Spokane in 1977, attended Gonzaga Prep and played football for WSU where he graduated in business in 2000. He was a four-year letter winner in both football and baseball at WSU and garnered All-Pacific 10 Conference honors three times. He was a four-time Pacific 10 All-Academic selection for football. As a senior he was a GTE Academic All-District VIII First Team selection and received WSU’s Beulah M. Blankenship Outstanding Student-Athlete award and the Student-Athlete Advisory Board Outstanding Senior award. Gleason went on to play professional football in the NFL for seven seasons with the New Orleans Saints. He may be best remembered for blocking a punt that resulted in a touchdown in the Saints’ first game in New Orleans in nearly 21 months following the devastation of Hurricane Katrina. He formed the One Sweet World foundation focusing on literacy and environmentalism. In the wake of Katrina, the foundation launched “Backpacks for Hope” to provide school supplies for young hurricane victims. More than 7,000 backpacks and other assistance were donated from across the country. Gleason was featured in a 2013 episode of the documentary series, “A Football Life,” that detailed his career in the NFL and battle with ALS. He was named to the Gonzaga Prep Hall of Fame and, in 2014, the WSU Athletic Hall of Fame. He won the Special Teams Player of the Year award for the Saints in 2006-07 and was awarded a Super Bowl ring from the team in 2011. In July 2012, a statue of Gleason, “Rebirth,” was raised outside the Superdome in New Orleans – a reminder of his and his team’s “resilience in the face of disaster,” as one news report commented. Learn more about Team Gleason at http://www.teamgleason.org/. Learn more about Spokane’s Gleason Fest at http://gleasonfest.org/. The WSUAA Alumni Achievement Award was created in 1970 by the WSUAA Board of Directors to recognize alumni who have given outstanding service to WSU and made contributions to their professions and communities. The award is the highest honor bestowed by the Alumni Association. Of an estimated 250,000 students who have attended WSU, Gleason is the 516th Alumni Achievement Award recipient.